The PORT OF STEPHENVILLE (formerly Port Harmon) is located in Stephenville, Newfoundland and Labrador, Canada. The port services international and national ships, fishing, aggregate, container and special freight. PORT OF STEPHENVILLE is capable of accommodating most vessels, freight handling, storage and trans-shipments, and has a Custom Bonded Warehouse facility on the dock. PORT OF STEPHENVILLE is directly connected to the Trans Canada Highway (16 KMs Away) by Highway 490 (1.5 KMs Away). The Stephenville International Airport is adjacent to the PORT OF STEPHENVILLE. The area is also serviced by a regional hospital located in the town. The Town of Stephenville is the service center for a population of over 25,000 and has all services. PORT OF STEPHENVILLE operates year round and is a sheltered, deep sea and ice free port. The quay is 293m x 20m, with 7500 sq m of asphalt paved dock area. The depth is 10.1m at dockside. It can accommidate ships up to 385m in length. The turning basin has a 450m turning radius. Access to 2 boom cranes, a jib crane and 3 different capacity fork lifts of up to 8000 tonnes, to facilitate loading and unloading of containers and cargo at dock side. The 100,000 sq ft PORT OF STEPHENVILLE Warehouse Building is newly refurbished and has three 30 ton overhead cranes. Warehouse, Inventory and port operations personal are available. PORT OF STEPHENVILLE operates according to the Canadian Federal Ports standards. PORT OF STEPHENVILLE complies with "ISPS" code International and Port Facility Security Code of "IMO" International Marine organization. PORT OF STEPHENVILLE has MARSEC Level 1 Security. PORT OF STEPHENVILLE has a 24/7 Tug Service. Located on the North shore of Bay St. George, approximately 50km east of Cape St. George. Navigational season is year round with occasional icebreaker assistance during winter months. 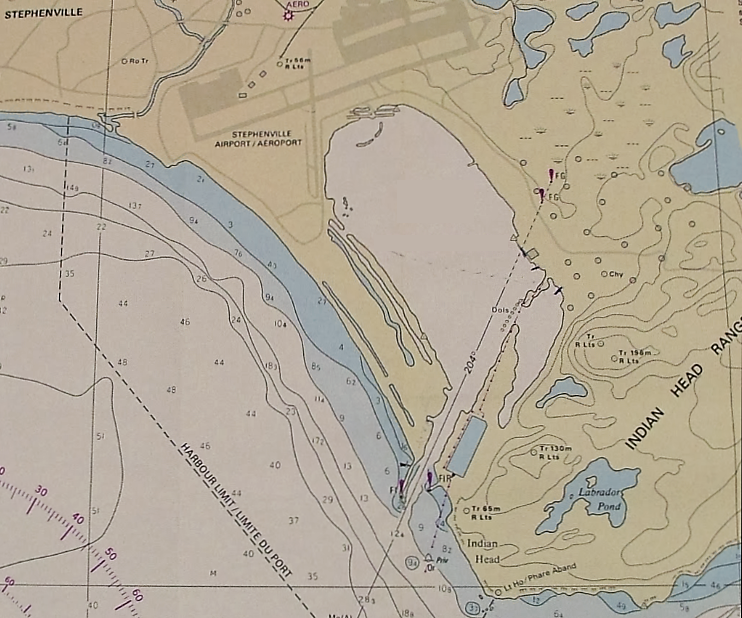 Latitude: 48° - 31' - 46" N.
Longitude: 58° - 31' - 30" W.
The PORT OF STEPHENVILLE entrance channel is 72 meters wide by 2100 meters long dredged channel with green leading lights passing over a depth of 10 metres, reduced to lowest normal tide. NOTE: Vessels with draft exceeding 10.0 metres, should contact the Harbour Master for further information, at 709-643-5626. 16 156.800 Mhz Tx/Rx 5 Watt Licensed Vessels only for Initial contact. All other uses prohibited. PORT OF STEPHENVILLE is positioned in Western Newfoundland, ideally located for shipping in North America, Atlantic Canada, Europe and the Artic. A proud heritage... PORT OF STEPHENVILLE has served as a base for navel, commercial and government marine operations for national and international users. Constructed by the US Corps of Engineers in the early 1950s. In 2003 it was privatized. In 2016 the name was changed from Port Harmon to Port of Stephenville. Copyright © Port Harmon Authority Ltd. All rights reserved.